"Refugee! Refugee! You're a refugee!" The kids on the playground started calling names and teasing the new girl in their school. Lamiya Safarova [pronounced lah-ME-yah sa-fa-ROH-vah] looked up at them and started to cry. It wasn't her fault that bombs and missiles had been aimed at her little village of Jabrayil (pronounced ja-brah-YIL) in Azerbaijan and that her family had been afraid that one might explode on their house. It wasn't her fault that the neighboring village, Khalafli, had already been burned to the ground or that enemy soldiers had threatened to kill everybody who didn't leave, or that kids were being kidnapped and held hostage until their parents could pay huge sums of ransom money to get them back. It wasn't her fault that her family had barely been able to bring anything from their home when they fled, or that she was poor now and didn't have pretty clothes to wear or that she was new at this school and didn't have many friends. Lamiya often found herself daydreaming about her old village where tulips grew in the springtime, hugging the high mountains of the Caucasus. She often wondered what had happened to the friends she had left behind. Were they still alive and if so, where were they living now? Would she ever see them again? And what about the house that her father had just built? Was it still standing? Had everything inside been looted and destroyed? Or had it been burned to the ground like so many others houses? It wasn't her fault that there was a war with Armenians who were trying to push the Azer-baijanis off their land, and that nearly a million people like herself had had to flee their homes and find a new place to live, new friends, new schools, new jobs. So when the kids called her "refugee", it hurt her very deeply. In English, "refugee" means a person who is searching for protection and safety-a shelter from danger. The same word, "gachgin" [pronounced gotch-GIN], in the Azeri language also carries with it the idea of "runner," meaning a person who has run away from something-a person who isn't brave and didn't try to fight but just ran away. But Lamiya knew that wasn't true. And that's why she started crying when they called her "refugee, refugee". She also knew that the kids wouldn't understand what she had lived through. It was too different from their own lives. Baku was too far away from Jabrayil. It would take you five or six hours to drive there by car. How could kids really understand the war that was going on over there? That night, Lamiya went home and started writing a poem. She knew that she would burst inside if she didn't write it down. She called the poem, "Don't Call Me Refugee." She was nine years old at the time. Has been so painful, so don't call me refugee. I beg of you, please don't call me "refugee". Turning back to look at my village. I've dreamed only about our house. Is that living a meaningless life is like hell. Lamiya learned to read when she was five years old. She has learned two different alphabets because Azerbaijan has a new alphabet called the "Latin alphabet" which looks very much like English. The old alphabet is called "Cyrillic" which looks very different and has more letters. Cyrillic is used for writing the Russian language and was used in Azerbaijan before it became a free country in 1991. Because the Latin alphabet is so new in Azerbaijan, very few children's books have been printed using it. It costs lots of money to print new books. So kids in Azerbaijan who really like to read have to learn the new alphabet and the old alphabet, too. Lamiya used to borrow books from the school library in Jabrayil, especially books of poetry. When she was eight years old, she started writing her own poems. "Mulberry Tree" was the first one-it was about the mulberry tree in their garden at home in Jabrayil. Now Lamiya is 12 years old and has written hundreds of poems about many different topics. Her family loves her to write poetry. In fact, her mom arranged to have Lamiya's younger sister and brother sleep together with their parents in one room so that Lamiya could work quietly all by herself late at night in the only other room in their tiny house. It's a simple room with only a bed and one dim, naked light bulb hanging from the ceiling. Night after night, Lamiya starts working at 2 or 3 in the morning, writing the things that she feels in her heart. She says that when she writes, she has a calm sleep and beautiful dreams. When she doesn't write, her dreams get "mixed up" and she doesn't feel at ease. When it rains and the roof leaks, her mother spreads a plastic sheet over the beds so no one will get wet. Once, Lamiya's mother woke up in the middle of the night, went into Lamiya's room and found her sitting on her knees on the cold cement floor bent over her notebook, writing. Water was dripping down on Lamiya's head from the leaking roof. "Go to bed," her mother scolded. "We don't need your poems if you get sick and we lose you." But Lamiya kept writing, upset with her mother for interrupting her thoughts. Lamiya works hard to make sure that she has chosen the right words for her poems. She wants them to rhyme at the end. After she's sure that everything is right, she copies them neatly into her notebook in ink. Usually her mother is the first one to hear her new poems. Her mom is very proud of her. Recently, Lamiya started to write short stories. She also likes to draw, compose music and play the saz (a traditional Azeri instrument). Lamiya hopes to grow up to be a famous poet and journalist someday. Her sister wants to be an English teacher and her brother, a singer. Her mom says that if these three things happen, she will be the happiest mother in the world. In the meantime, Lamiya is dreaming of the day when she and her family can go back to their home in Jabrayil, the day when no one will ever dare call her "refugee" again. What's the meaning of telling him "Love it!"? What's the meaning of telling him "Know it!"? What's the meaning of calling them back? What's the meaning of living then? What's the meaning of saying, "Go back"? Then what's the meaning of telling him yours? Someone else's garden your own? Someone else's city or village "Motherland"? Don't call everyone who writes, a "poet". What's the meaning of my poem? But what's the use of telling you about it? I can't come to see you for many years, Land. I don't know where I lost you, Land. Once again there is fog on your mountain peaks. Today we need to get our land back. Let us wipe its tears away soon. I am coming to see you again. Our language is the same, Azerbaijani. I am a poet and you, an intellectual. You're from the other side and I, from this. Uncle Reza, how dear you are to me. Your steadiness is a model for me. Lamiya will never forget you. 1 "Other side" means Southern Azerbaijan which is in Iran. The country was divided into North and South in 1813 and 1828. 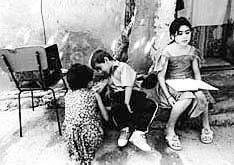 The northern part where Lamiya lives is called the Republic of Azerbaijan; the southern part where Reza comes from is in Iran. Reza met Lamiya last year when he was taking photos for National Geographic Magazine. In 2001 Reza went to Afghanistan to train the young people in camera work. See other articles by Reza about photography. You gave me this beautiful world. I owe you my life, Mother. Dear Mother, I owe you so much. I'll dedicate my poems and stories to you. I'll sacrifice myself for you. That I love more than myself. "Just sit, don't get up." If you would like to write a letter to Lamiya, send an e-mail message to ai@artnet.net or a letter to Azerbaijan International, Box 5217, Sherman Oaks, CA 91413 USA. Betty Blair is editor of Azerbaijan International. She met Lamiya at her home in Baku last fall. Vafa Mastanova, also contributed to this article, as did Roshanak Bayramlou, a student of Fine Arts from Paris who lived and studied in Baku in 1997 and who photographed Lamiya. Roshanak identified Lamiya as a promising poet. She also took the photo of the refugee girl that appears on the back cover and of Refugee Children at Play. In 2002 Roshbank went to Afghanistan to help train photographers there in the struggle to rebuild thier country.